Torn and stretched out earlobes can be unsightly, causing affected people to feel self-conscious about how they look. At Castleknock Cosmetic Clinic Dublin we see patients with large earlobes which develop with age. Just like the aging process in other areas of the face, our earlobes can simply sag over time; due to gravity and loss of elasticity of the skin. Earlobe repair is a cosmetic procedure designed to address stretched, torn, gauged, or unusually long earlobes. The aim of earlobe repair surgery is to correct damaged earlobes and restore self-confidence in affected people. Ageing: As we grow older and as time passes a pierced earlobe can become stretched. Heavy Earrings: In due course if a person habitually wears oversized or heavy earrings. As well as creating an unsightly long or wide opening, earrings may tear completely through the lobe. Trauma: Many people suffer earlobe damage due to physical trauma, for example having an earring pulled off or caught on clothing. If an earring is ripped out, it can cause the lobe to split. If this division doesn’t repair correctly it may create an unsightly mark in the earlobe. Long earrings: On other instances, a large pendulous earrings can cause damage over time. After several years of wearing long and heavy earrings, the opening from the piercing in the earlobe can stretch out significantly. Elasticity: Pierced ears can lose their elasticity over time, making it difficult to wear earrings properly. Ear studs won’t be able to stay in place because of the enlarged piercing hole, and wearing dangling earrings puts the earlobes at further risk for splitting. Tribal piercings: In the early naughtiest, tribal-style piercings, those with large gauges were popular. 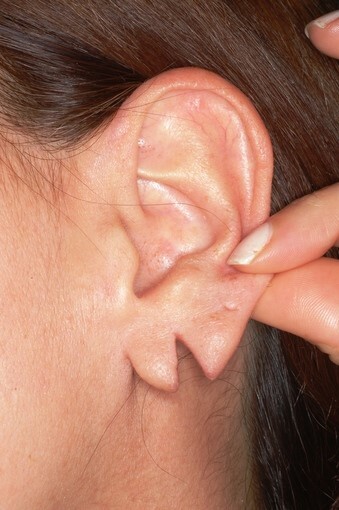 Large gauge earrings can cause damage to the earlobe. The gauges create sheer forcing a “flesh tunnels” that won’t heal on their own once the gauge is removed. Many men or women who get earlobe gauges during their younger years want to reverse the process once they begin to pursue a professional career, or simply grow tired of the trend. Earlobe repair procedure is a relatively painless surgery. The procedure takes only 30 minutes per earlobe to complete. The procedure is performed with local numbing. Patients may feel the initial needle scratch, but the remainder of the procedure is straightforward. If the damage to your ears is a result of large gauges, then Dr Hazem Kahlout will remove the stretched skin. At the end of the procedure he will close the site with sutures (stitches) to recreate as normal an earlobe shaped as possible. 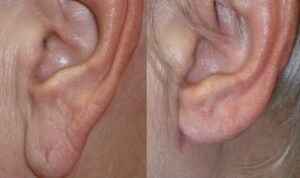 Some scarring will results after the earlobe repair procedure is complete. Any scarring will fade over time. Your earlobes should be back to normal after about four to six months with no signs of prior damage and only faint residual scar. You can also have your ears re-pierced a few months after the procedure if you so choose. Although it is a relatively simple cosmetic surgery, the procedure can dramatically improve a patient’s self-confidence. At Castleknock Cosmetic Clinic Dublin we see people seeking correction of stretched-out earlobes for various reasons. Often, they are tired of the look of hanging or drooping earlobes and want to either go without piercings altogether, or wear smaller, more conservative earrings. In other instances, they may have changed their overall style from alternative to more traditional, or they may be looking for a new career where their earlobes might make a statement that doesn’t complete their current personality. Many people remove large gauge earrings for professional or change in lifestyle reasons. Correcting the damage that occurred from wearing these can help some acquire new employment in jobs that restrict these types of jewelry. Cosmetic procedures renovate, improve or modify a part of a person’s body to improve their self-image and self-esteem, as well as to provide them more satisfaction with the appearance or function of targeted part of the body. With earlobe repair either from wearing large gauges or due to torn earlobe or enlarged piercing hole, it is usually a cosmetic concern “to want to have normal looking earlobes again”, but it also will allow the person to be confident about their appearance once again and to wear normal earrings. Ultimately, earlobe repair is a very gratifying procedure for a lot of our patients, where it enables them to move forward without even thinking of their earlobes afterwards! Torn earlobe repair first involves refurbishing the edges of the torn lobe by removing a tiny slither of skin. Then, using fine sutures, the earlobe is meticulously repaired to recreate a normal, rounded earlobe that matches your natural ear shape as closely as possible. You will be able to return home immediately after the procedure, with only a small bandage covering the stitches. The stitches will be removed one to two weeks later. When the earlobe has healed and the scar has softened, you may re-pierce the repaired earlobe. It takes about three months for the earlobe to fully heal.